AMHSI students having a toga party while studying Hellenism. I apologize if I sound cynical but I am puzzled and disturbed by the vagueness of knowledge of “the story.” How can an important festival be transformed into a meaningful occasion if our understanding of the historical background is so vague as to cast the events almost into the realm of fantasy. The miracle of the oil has lost context and as a story of a miracle (which deep down most people don’t really believe anyway), it has become a fable of no great significance other than to enable us to reach the real point of the evening, the family time, the food and the presents. How can we go a little deeper? At the Alexander Muss High School in Israel we teach Jewish History in a manner that our students have never encountered before. Historical incidents are given context and relevance by inviting the students not just to learn facts but to actually enter into a historical period, live it and experience the dilemmas that faced our ancestors. The land of Israel first came under Hellenistic rule in 332 BCE when conquered by Alexander the Great. By the time of the Maccabee rebellion against the Seleucid Empire in 167 BCE, the land had been governed by a variety of Hellenistic rulers for over 160 years. Hellenism had brought to the land a highly attractive culture, a world of art, philosophy, sport, Greek literature and science. Judea was covered with Hellenistic bath houses, academies and gymnasiums. Yet the land was also filled with the more problematic elements of a culture that permitted or encouraged promiscuity and immodesty, promoted polytheism, practiced slavery and valued the material above the spiritual attainments of mankind. It was a culture that despite its attractiveness challenged and threatened the most precious Jewish values. 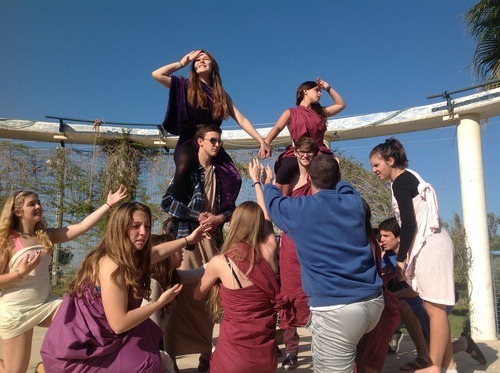 If you were to visit the AMHSI campus in Hod Hasharon on our Hellenism day, you would discover bands of teenagers, dressed in alluring togas (usually made of their bed sheets) with garlands on their heads competing vigorously in Hellenistic contests, indulging in Hellenistic luxury, engaging in drama, sculpture and wrestling competitions. The students, while enjoying themselves, are experiencing firsthand the allure of Hellenism. When they eventually return to the classroom they are able to debate the dilemmas that faced our ancestors of the second century BCE with the perspective of an insider. It is not a boring lesson of ancient history. It is a passionate discussion about cultural assimilation, about the attraction but the challenge of living in the midst of a dominant world culture which offers so much yet pulls the Jew away from his or her distinctive identity. The historical re-enactment of Hellenism becomes the base for a serious reflection on how we, as Jews, today face the challenge of living within a culture that is enticingly inclusive yet poses serious challenges to our mission to preserve our own value system. And when the students of AMHSI gathered together this week to light their Chanukah candles, with a deeper understanding of the underlying story behind the actual events of Chanukah, the festival takes on a whole new layer of meaning. It has become not a vague and undefined story but a meaningful event in which we celebrate not only the miracle of the oil that burned in the Temple Menorah but the real miracle of Jewish survival. And the jelly doughnuts and latkes taste sweeter than ever.